Looking for new ideas in your wellness? In this age of technology there are new ways of managing mood disorders right at your finger tips. I searched Google Play on my Android phone today for “mental health app” to receive a multitude of results. There was everything from breathing exercises, to trackers, to chat therapy. Since I lack the time to research all options available, I turned to the Internet for recommendations. 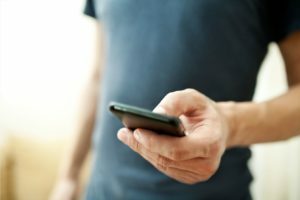 PsychiatryAdvisor.com has composed a nice well-rounded list of 10 apps to try (especially if you are like me and overwhelmed at where to start). 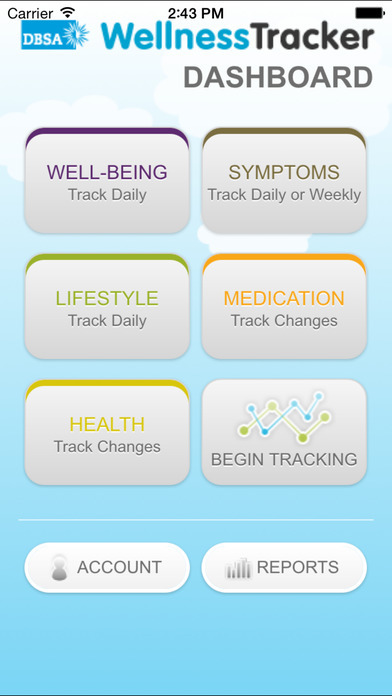 A Techie Way to Wellness – There’s an App for That! 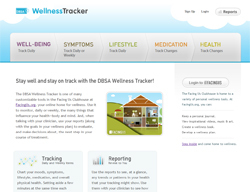 Did you know that DBSA has its own Wellness Tracker App? Let’s face it, as a society we have become dependent on our phones. Since we never go anywhere without them, what better way to keep track of your emotional, mental, and physical health. Other trends you can track are lifestyle (sleep, exercise, etc.) and medications (including those pesky side effects). There are monthly reports with summaries of how you Actually felt (as opposed to how you think you felt based on your mood while you are talking to your doctor). A good log will also help you identify consistent triggers you face in your life. 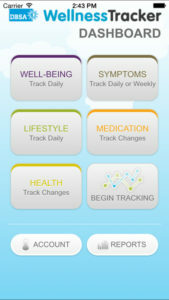 This is all super valuable information for your clinician to help create a wellness plan completely customized to you! If you do not have an account, you can create a new one from the app’s initial screen or by going to https://www.facingus.org/account/signup. Prefer to track using your computer? No problem. FacingUs.org is the tool DBSA uses to store your daily logs. A digital filing cabinet of sorts. Your information is yours and will not be shared. Once registered, you will also be able to use all of the other features and tools on FacingUs.org. Kansas City Triage and Assessment Center held a grand opening today, October 28th, at 2600 E. 12th Street in Kansas City. The new facility will have eight beds for mental health crises and eight beds for people in alcoholic distress to stay for up to 23 hours. The center is designed and opened as an alternative to the ER or jail. In efforts to promote National Depression and Mental Health Screening Month in October, 2016; Mental Illness Awareness Week (Oct. 2-8); National Depression Screening Day (Oct. 6); World Mental Health Day (Oct. 10);. Veterans Day (Nov. 11); International Survivors of Suicide Day (Nov. 19); and Mental Wellness Month in January 2017, season 4 of Healthy Minds with Dr. Jeffery Borenstein is being release on national public television, including local KCPT channels. NEW YORK, Oct. 5, 2016 /PRNewswire-USNewswire/ — The national public television series Healthy Minds with Dr. Jeffrey Borenstein aims to remove the stigma of mental illness, educate the public and offer a message of hope by humanizing common psychiatric conditions through inspiring personal stories, cutting edge research on diagnosis and treatment, and interviews with well-known personalities, including Brian Wilson, Patrick Kennedy, and Nobel Prize Winner Eric Kandel. For a complete list of episode topics and other mental health information and resources, please visit the Brain & Behavior Research Foundation’s website. Don Goldman, Executive Director of Jewish Family Services of Greater KC, is coming this Thursday (October 20th) to DBSA Overland Park’s regularly scheduled support group. Mr. Goldman will be discussing topics important to our support groups including mental health conditions, substance abuse, trauma, and eating disorders. JFS is committed to providing comprehensive human services to the Greater Kansas City area. They serve people of all faiths who are in need. Program services include Career Skills & Connections (CSC), Chaplaincy, Counseling and Mental Health Services, Family Life Education, Food and Shelter, Older Adult Services, and Volunteer Services. For complete descriptions of what these services include, please visit http://www.jfskc.org/services/. With offices in both Kansas and Missouri, and volunteer drivers to help their clients to and from appointments, JFS is accessible to all looking for help. Please join us in welcoming Executive Director Don Goldman for this very important informational presentation. 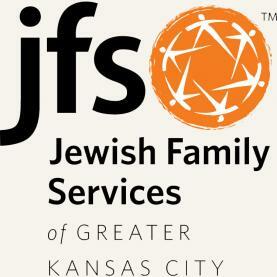 JFS services are an important part of wellness in the Greater Kansas City area. We will also be hosting a regular support group in a separate room at Baker University for those needing peer support counseling. Hours of Business are Monday-Thursday: 8am-5pm and Friday: 8am-3pm. Some evening appointments are also available by request at 913-327-8250 and info@jfskc.org.